The perfect reading program for older children and adults who need to learn to read. Uses the same principles of Sing Spell Read & Write, but with graphics and materials suited to an older learner. WINNING is a "how-to" read and spell program written especially for students who need a new beginning. Sensitivity to the needs of older students was a major consideration in its development. Eight learn-to-read phonics songs on the CD are In rock, rap, country, and jazz arrangements with adult singers. The four student books look like sports magazines for motivation and discretion. They contain all the lessons to take students from step one to independent reading ability. The program contains 1,750 spelling words and 70 correlated learn-to-read stories written especially for this target age group. Manuscript and cursive writing lessons, word comprehension tests, story comprehension tests, and special life skills section in which students learn to fill out applications for a job, etc. are included. The Home Kit Includes: The Winning Phonics Songs CD, The Winning Phonics Songs DVD, Instructors Seminar DVD (Sue shows you exactly how to use this program step-by-step on this DVD). 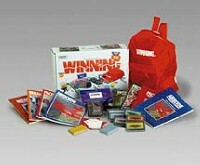 4 separate Student Books (Frontrunner, Breakaway, Pacesetter, and Airborne) and 4 instructor Manuals, A-Z Pick-A-Sound Game, Letter Cluster Pick-A-Sound Game, Raceway Markers, Plastic Chips comes in custom box. Researched and designed to teach older students how to read, write, and spell using an age-appropriate curriculum that goes step by step to independent reading ability. Tests incorporated throughout the curriculum. WINNING has a long track record of success and many testimonials from satisfied users. For 4th grade and up non-readers, struggling readers, L.D., and Special Education Students. This product would be drop shipped to you from the publisher.